On the weekend, I found out that two of my friends and fellow members of my Bottle Club were directly effected by the Victorian Bushfires. One of them was 30 metres away from the firestorm, the only reason he is still alive is because 3 CFA helicopters dumped water infront of him, just in time. However my other friend was not as lucky she lost her eldest son in the fires. I cannot imagine the hurt that they must be feeling in the community at the moment. 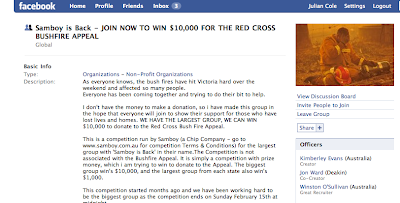 The other day I got an interesting Facebook request from a friend asking me to join the group Samboy is Back - JOIN NOW TO WIN $10,000 FOR THE RED CROSS BUSHFIRE APPEAL. Kimberely Evans had taken advantage of the competition that Samboy’s chips were running to see who could create the biggest Facebook Group with the words Samboy is back in them. She had hijacked the competition for social cause. A higher need. Samboy are also holding Flavour Hit Film Festival where they are asking to create a video of 'How the Flavour hits you?' and to include an end graphic. 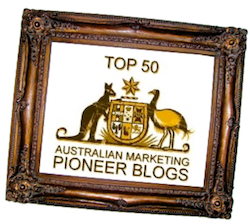 The most viewed clip on Youtube will win $5000. I decided to create a video to try and win the $5,000 prize for the most viewed clip so that I can donate the money to the Red Cross as well. I think this is a win-win situation for all parties involved, The Bushfire victims get hopefully $15,000 that they were not getting before and Samboys chips gets awareness of their relaunch that looks to be their main objective of the campaign. My best friend from high school lost his father in the fires at Marysville, it has been a tough time for all and every dollar raised does so much good! 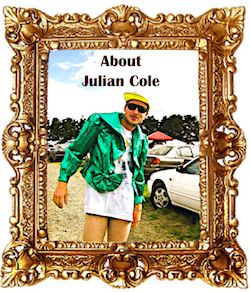 The rationale seems OK, but jeez Jules, it feels a little tacky. I guess at the end of the day I think to myself, I could be potentially helping give $5,000 to the Red Cross and people who really need it. Is that worth making something a little tacky and not my best work? I think, yes. @Josh Thanks Joshie, hopefully we can get the money for them. All the best with the idea and great cause. I just hope it is not another social media stunt as you seem to be pretty close to the whole Samboy thing and the competition T&Cs clearly state "related agencies" are not elegible to participate. @Anon, I can 100% promise you that I am not a related agency. I have never worked on Samboys or an agency that is employed by Samboys so I do not think there will be a problem. 7 things you didn't know about me!